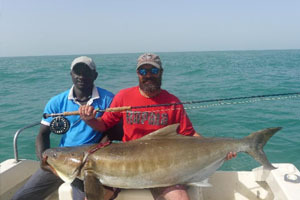 French angler Anthony Guenec potentially set the new men’s 10 kg (20 lb) tippet class world record for cobia (Rachycentron canadum) with this massive 42-kilogram (92-pound 9-ounce) fish that he caught on March 5, 2018 while fly fishing off the Bijagos Islands in Guinea Bissau. Guenec played the hard-fighting cobia for over an hour after it took his fly. If approved, Guenec’s catch will be the heaviest cobia ever recorded by the IGFA on fly fishing tackle! The current men’s 10 kg (20 lb) tippet class world record stands at 34.01-kilogram (75-pound). 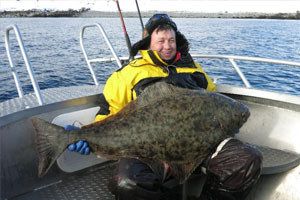 Russian angler Sergey Prachik caught this 22.70-kilogram (50-pound) Atlantic halibut (Hippoglossus hippoglossus) on March 24, 2018 that could potentially earn him the new men’s 8 kg (16 lb) line class world record. Prachik was fishing off Soroya, Norway when the halibut hit the dead fish he was using for bait, and he needed approximately 30 minutes to subdue the fish. The current world record stands at 15.87-kilogram (35-pound). 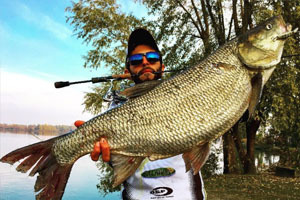 Italian angler Giovanni Stanzione caught this 10.34-kilogram (22-pound 12-ounce) asp (Aspius aspius) on April 12, 2018 while fishing Lake Mantova, Italy. Stanzione played the fish for approximately 15 minutes after it hit the lure he was casting. This is the heaviest asp ever recorded by the IGFA and if approved, the catch will become both the new All-Tackle world record, as well as the new men’s 3 kg (6 lb) line class world record.